The day began at 7:00 am this morning and thankfully Trevor and Karl were relatively quiet last night so I woke up refreshed. We had pancakes for breakfast and I asked the lady serving us “Como se dice?” a phrase Trevor Main taught us that means “What is this called?” and she answered back “Pancakes”. As much as things are different here in Nicaragua, many things are the same. We left for the work site at 8:00 and along the way stopped and picked up a few snacks to nibble on as we knew the day would be ending at 5:00. When we arrived to the work site around 9:00 Kirben, one of the local workers, was already there with shovels and wheelbarrows. Kirben is an incredibly conscientious and hard worker and is well liked by everyone. Every once in a while he will recite scripture with an excitement and honest enthusiasm – I think he does it because he knows it is something we share and I feel it means more to him than it has ever to me, and it has me rethinking my connection to Bible verses and stories. Work at the site today involved separating and shoveling earth from the bank that the former house stood on. 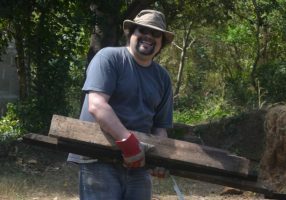 Dirt was then shoveled into wheelbarrows and moved to fill in the low spots on the field that will eventually be the foundation of the BIC Nicarauga church, office and conference centre. It is hard work. The ground is hard clay interspersed with layers of dirt. We started by depositing clay chunks on the field and then placed dirt on top of that. 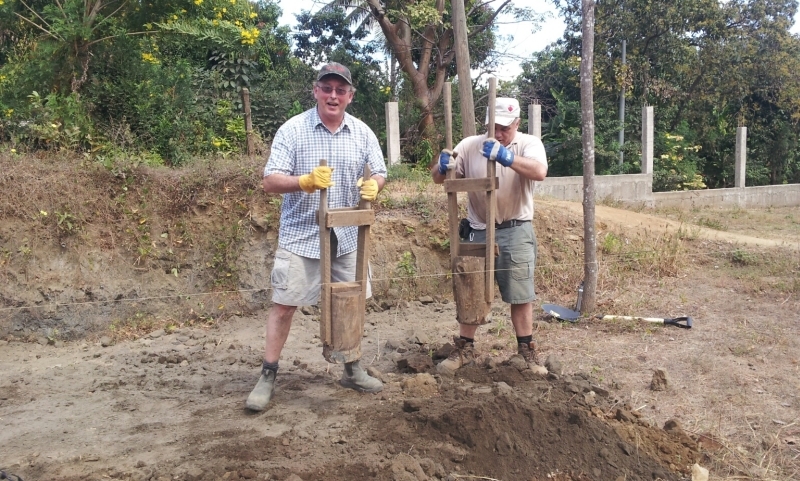 Then we tamped the earth and clay chunks into the ground using tree stumps fastened to two handles. Karl surprisingly had a real talent for this work and seemed to genuinely enjoy and not tire easily from it. I on the other hand switched roles often. Sometimes shoveling, sometimes pushing the wheel barrow, sometimes tamping and sometimes breaking off earth from the bank using a large iron bar. Fadah Luc made us a wonderful lunch again which we ate at Zenaida’s house. Zenaida has a beautiful home amongst a number of houses nestled on a plot of land. We eat outside under her front porch surround by flowers and greenery. Colourful roosters strut around and crow while the dogs lay in the sun or wander around seemingly disinterested. There are no fences anywhere to keep the dogs or chickens contained and I asked Ryan (since he told me he grew up on a farm) “I wonder why the dogs and chickens don’t run off or wander away.” Ryan answered, “They feed them.” Not so obvious to a city boy like me but obvious to Ryan. After lunch I went with Trevor, Pastor David and the girls to observe and help with the children’s ministry at a new church being started in rural hills. This was very interesting and appealing to me as the church was being hosted in someone’s home. This was the second day we visited (Trevor, Karl , Pastor David and the girls having visited yesterday). Yesterday’s activities were scheduled to begin at 2:00 and Trevor and company arrived about a half hour late. Today we arrived punctually at 2:00 and no one was there. We laughed as we all said they now assumed when Canadians say 2:00 they mean 2:30. Kids started arriving shortly thereafter and we (well, okay, Melanie and Brooklyn) sang songs (en espagnol) and kept the kids occupied while others were arriving. Brooklyn has a great demeanor with kids and they all lit up when she smiled at them while singing. And Melanie is fluent in Spanish when she sings – who knew? Elsie and Elyanca told children the story of David and Goliath and some of the kids knew the story but many did not. Elyanca is a school teacher; you could tell by the way she told the story and held the children’s interest. Kids loved the bear puppets that were made and given by the kids of Westheights Church. We left after Pastor David said a prayer for the new church and those working to establish it. The drive to the house was also a mini-adventure. Once in the hills the road often turned into what is probably best described as an ox-path. At one point we were told that the part of the road we were on was not passable during the rainy season. One interesting thing I noticed was the number of pigs on the road. Again I guess they know who feeds them so they don’t wander far and I had the distinct feeling that everyone around knew whose pigs belonged to whom. On the way back we stopped and picked up some pineapples as the region was known for growing them. We passed many roadside stands and Rosalita and Louisa, two church members who needed a ride and came along with us, recommended a stand. We picked up the men on our way back to the work site and headed back to our hotel for a shower and then dinner at a Papa John’s Pizza. Then back to the hotel where we played cards. And now off to bed for us. Thanks for all the great updates. It sounds like the work is hard but also very rewarding. We are keeping the whole team in our prayers. This being the weekend, I expect that you will be taking the time off. Since it’s natural that you might be visiting the church we worked at last time, please send them our regards. Great account! Our prayers are with you all. Thank you for the detailed update! It sounds like an amazing experience for all of you . Keeping you all in our prayers.